I don’t know if you’ve come across Whack-A-Mole. Basically it’s an end of the pier arcade game where you have to basically bludgeon cute plastic insectivores every time they pop up to check the whereabouts of the mallet-wielding extremist they’ve been hearing about below-stairs. Its fun and cathartic and of course, as blood sports go, is at the less murderous, more kiln-based end of the pigeon shooting axis. Well, during the pre-season games and the opening stages of the Conference South season, I’ve been having my own internal game of Whack-a-Mole, the mole in this case representing ‘optimism’. Any sprigs of belief that appear have been quickly suppressed with the kind of relentless hammer action that could win someone an apprenticeship under the tutelage of Thor. This is a self-preservation technique more than anything else. Last year during pre-season, I had let myself believe that with money in the tin and a great many of the previous season’s Conference South winning side in our first XI that we would walk it like a thoroughbred stallion in its sinewy prime. We quickly had to reassess this and downscale ourselves through ‘stalking horse’, ‘also-ran’, ‘flea-ridden mule’ and finally to ‘lost goat’. Still, in the most part, Shaun Gale retains the goodwill of our support – his dedication to the cause meaning most are prepared to give him another chance to prove he’s up to the task of getting us promoted. That said, many of those remain sceptical that he actually can take that chance, with others going so far as to be boycotting home games until such time as Shaun leaves the hot-seat. An opening draw at home to Thurrock meant I could leave my hammer in its holster, but it’s been back out on the beat since last Tuesday night’s victory away at Bromley. Apparently (sadly I’ve had to miss both games thus far due to being on me holidays) we spent most of the game under the same kind of cosh as that which I’ve been subjecting my more confident thoughts to, yet didn’t leak, allowing our new star striker Manny Williams to score a quick-fire brace in the final ten minutes. Which does nothing for a chap trying to keep the giddy locked up. We were even keener on that point after the first twenty minutes as we had been second to every ball, conceding a soft goal in the fifth minute and looking ripe for a mullering. However, in the 25th minute, a high boot connected with Wes Fogden’s winkle-picking schnoz, earning us an indirect free kick in the penalty area. Now these efforts are usually a bit of lottery, given that the defending side always sardine their panicking bodies all along the goal-line. Any attacking player asking advice on approaching this kind of set-piece would receive the same answer as someone asking what might be the best way to get to the top floor of a skyscraper i.e. ‘try and get lift’. 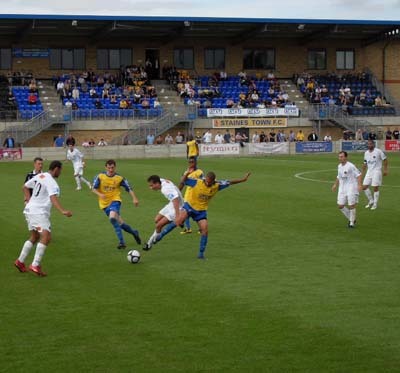 Thankfully Mustafa Tiryaki was able to do just that [see above], and fiercely so, cometting his shot through the entire Staines first XI, who were offering up two different challenges. Some played musical statues on the line, guarding their groins as securely as a spendthrift does their wallet. The others charged upon our Turkish hero like early-bird Boxing Day bargain hunters towards cut-price plasma-screen tellies. Yet he out-foxed both parties with the kind of shot that makes “Boom! Shake The Room” start playing involuntarily on your internal jukebox. Fifteen minutes later, if the equaliser hadn’t been shocking enough, we had another goal, and not just any old goal either. Some goals make you jump up that little bit higher, some goals make you scream just that little bit louder, but then there are other goals, special goals, beautiful goals. 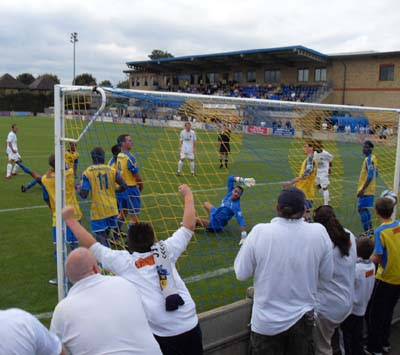 A goal such as this is quite rare of course, particularly at this level. It is the kind of goal that makes you want to leave your job immediately and dedicate your remaining days to writing epic poetry about it and sculpting marble effigies of the scorer. Hyperbole it may be, but Manny Williams’ strike [see above] genuinely did take my breath away. Receiving the ball just inside the box and about two feet in front of the by-line, he was being closely attended by a defender but flicked the ball behind them both, turned like a ballerina and raced towards their keeper Louis Wells (who appeared to be taking time out from his day-job as an Owais-Shah-a-gram). Manny cut inside a little bit but was still working from a pinstripe of an angle, yet he made it look like a gaping chasm as he hammered the ball through Wells as though he were merely an apparition. Quick feet, quick brain, knows where the goal is, and a little bit of magic; I’m going to like this chap, I thought as the ball nestled in back of the net. The second half was not without its challenges, partly from the home-side reasserting themselves and dominating large periods, and partly due to the fact that an injury to a linesman meant a twenty-minute delay whilst a replacement was pulled out of a wizard’s sleeve. The PA announcement suggested he’d been passing by, which suggests under-employed refs are lurking outside grounds throughout the country on the off-chance they might get to squeeze on the old shorts and make like a crab down the touchline one more time. Still, it’s a relief someone could be found, as an abandonment would have been devastating, not so much for result purposes (as we still had fifteen or so minutes to defend at that point) but that it would have meant Manny’s wonder goal would effectively have been declared null and void, and would have ripped all the poetry right out of it. 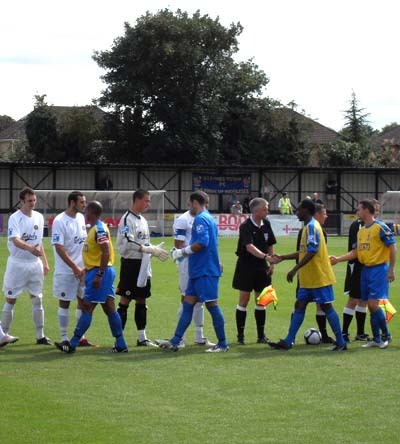 However, we not only got going again, but we got the hen’s teeth spectacle of a match official being given a warm-hearted ovation as he walked onto the field. A salute and a grin was his response. It was tough stuff for most of the quarter hour epilogue. 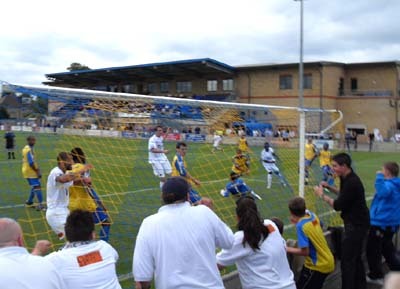 Whilst we created chances, we also had to endure wave after wave of pressure, but it was a terrific defensive effort and, as my London Branch colleague Adam was keen to note, it was great to see a Havant & ‘Ville side fighting back when a goal down, and not resting on their laurels once in the lead. Looking back, we had too many passengers last year. So far this season, it appears that we shan’t go wanting for strong hearts and sweaty effort. However, I’m still going to wield this mallet over my optimism for a while yet. Three games is merely a single swallow; the season a long, long summer.